Though forging process provides good quality products compared to other manufacturing processes, some defects that are lightly to come if proper care is not taken in forging process design. 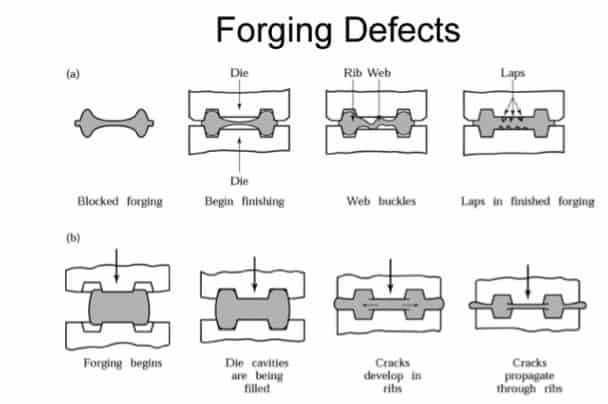 A brief description of such defects and their remedial method is given below.Forging defects are explained below. This defect refers to localized unfilled portion within the die cavity due to improper design of the forging die or inappropriate selection of the forging technique. Cold shut appears as small cracks at the corners of the forged part that is caused primarily due to very tight fillet radii that inhibit smooth material flow towards the corner of the die. Scale pits are seen as irregular deputations on the surface of the forging that is caused primarily due to improper cleaning of the stock used for forging. The oxide and scale gets embedded into the finish forging surface. When the forging is cleaned by pickling, these are seen as deputations on the forging surface. Die shift is caused by the misalignment of the top and the bottom dies making the two halves of the forging to be improper shape. These are basically internal ruptures caused by the improper cooling of the large forging. Rapid cooling causes the exterior to cool quickly causing internal fractures. This can be remedied by following proper cooling practices. This is primarily caused by the improper design of the die that induces material flow in an inappropriate manner leading to various defects. Surface cracks and decarburized areas are removed from forging parts by grinding on special machines. Care should also be taken to see that the job is not under heated, decarburized, overheated and burnt. Shallow cracks and cavities can be removed by chipping out of the cold forging with pneumatic chisel or with hot sets. The parting line of a forging should lie in one plane to avoid mismatching. Destroyed forgings are straightened in presses, if possible. The mechanical properties of the metal can be improved by forging to correct fiber line. Can you tell me more about warm forging? Great defects you shared with us but for more in Forging Process in detail.